Think pool noodles are just for the pool? Well, think again! In this week’s Think Outside the Toy Box challenge, we were tasked with coming up with a not so ordinary use for these fun, bendable summer toys and while we originally planned to find a way to use them outside, the constant rain has us changing up our plans. And, I get it! You may be wondering what we could have possibly done with pool noodles inside the house, but believe me, you’d be amazed at some of the ideas that we came up with before deciding on this one. 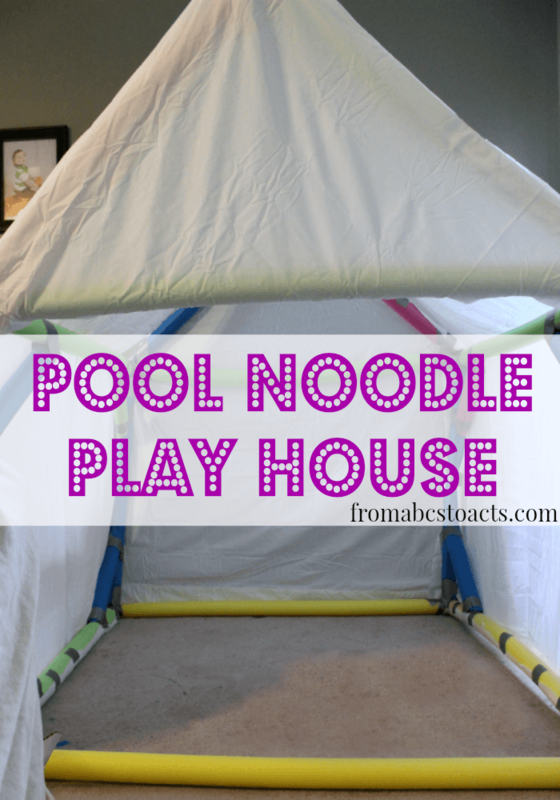 A pool noodle play house that is perfect for a gloomy, rainy day! Definitely not one of the most exciting or adventurous weekends, but we still had a blast making our own play tent out of pool noodles! Engineering challenge anyone?! It does take some time to set up, but the kids loved that they got to help “build” the house and spent most of the afternoon playing in it after we were finished. The best part was, we didn’t need a lot of materials to put it together! All you need are some pool noodles (obviously), duck tape, and a couple of sheets. We started off by creating a 2 squares with a few of our pool noodles and taping them together with duck tape. Once we had our 2 squares, we set one on the ground and starting connecting noodles to the corners. Once those were connected, we repeated this step but with the second square on top. You essentially want to build a cube. This will wind up being the base on which you build the rest of your house. Just measure how long you want them to be and duck tape your pool noodles together in and “X” shape to make the peak. Once you attach them to your play house you can cut the excess off of the top and put a pool noodle “beam” connecting them to create the top of your house. Once our entire play house structure was put together, we simply starting draping sheets on and securing them into place. Once all of your sheets are on, get to playing! You could cover the entire play house with sheets, just leaving an open flap for the door if you want. Our kids weren’t too fond of having it feel like the entire thing was closed off so we wound up leaving the entire front end open but it’s all up to you! Pool noodles are great for building small structures! Have you ever built something out of them with your kids? This post is part of the Think Outside the Toy Box summer series where 6 bloggers come together to bring you fun and creative ideas for kids using common household items! To see the rest of this week’s fun pool noodle projects, make sure you check out the other fabulous participating blogs! And if you’re looking for more fun ideas make sure you check out the rest of our Think Outside the Toy Box projects! Have a fun pool noodle project you’d like to share? Link it up! We’d love to see it!